Connected car experience without a brand new car! 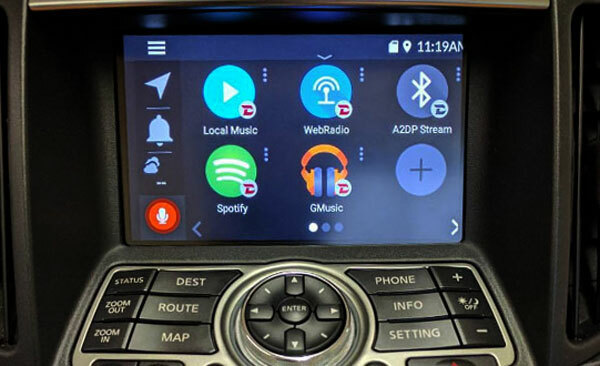 Integrate latest mobile technology to your factory stereo and access Google and Waze maps, Spotify, Web Radio and other music apps - directly from your factory touch screen. No need to replace the stereo. What is VLine: VLine is the smart computer that connects to the back of your Nissan/Infiniti stereo and integrates into the car infotainment system and touch screen display. VLine is superior alternative and easy upgrade for Nissan/Infiniti OEM stereo. Music Apps: Web Radio, Spotify, Google Music, Local (stored on the phone) music and others will be displayed on your car stereo screen. Use VLine plug-ins or open any app from Play Store. Apple CarPlay: use your iPhone apps on the touchscreen display.